I seem to have spent a lot of time talking to children about going back to school this week. My daughter, 9, has been sorting out her school uniform. My younger niece is starting junior school, my older niece is going to start secondary. Also, a few of my readers have been emailing about what they are looking forward to. And not. One of the things that I think schools do well now is they start the transition process before the summer holidays. In June and July I worked with several schools on transition days, where year sixes went to their new high school for days of activities and overcoming worries and preconceptions. I even worked with some secondary schools during the summer, where they hosted large groups of year sixes in their school without all the older children around. Summer School. My older niece did this and is very much looking forward to high school now. Even within junior and primary schools children spend a day or a week with their teacher for the next year. My daughter did this. So did my younger niece. As a result they are both looking forward to next year too. Changing schools and years is traumatic for children. And I am sure it is for teachers too. I tried to capture this is my new book, Secret FC. Secret FC is about a primary school with a new headmaster for the school year. But Mr Edwards does not enamour himself with the children. He bans football. His argument is that, with only one small playground for children aged 5 to 11, football is too dangerous a game to play. As a result the children find a place to play football secretly. And it goes well, until Mr Edwards discovers their furtive footballing. I was trying to write about how things will always change in a new school year and that it is important for people to talk about that change to each other. And that that is the best way of making sure change makes things even better. This entry was posted in Uncategorized and tagged back to school, new head teacher, new school year, risk at school on August 29, 2013 by whyiwriteblog. I use newspapers a lot in my school and library events. I like to ask the children – and adults – what they read in newspapers. The answers are usually: sport, celebrities, cartoons, puzzles, TV guide, cars, animals and news. Lots of children read newspapers. On paper – and online. I think it is important to validate children who read newspapers, whatever subject they are finding out about. Some of them tell me that they don’t think newspapers count as real reading: that reading books is the only real reading. I like to put them right on that. Reading newspapers is just as real as reading books. My daughter really enjoys reading First News. First News is a children’s paper with stories that will interest kids, written in a way that makes it engaging for them. She reads it cover to cover. She skips. She goes back to bits. She draws moustaches on people. I am really happy about it. If she’s engaging with an engaging newspaper, then she’s going in the right direction. I have found newspapers particularly useful this week. The seemingly unavoidable war with Syria is the main story at he moment. I have been following it on TV and the radio, but I never quite understand the issues until I read about it in the newspapers. I think part of it is that I can go back and re-read sections to understand what is going on fully. It could also be that I fade out while watching TV or listening to the radio. Sometimes. Newspapers work best for me if I am trying to understand something. Reading the newspaper today has helped me understand what the issues are, the pros and cons. I am still confused about what the best course of action is for our politicians to take, but at least I know why. This entry was posted in Uncategorized on August 28, 2013 by whyiwriteblog. I am reworking a children’s book for publication in March 2014. My deadline is… soon. The original version was 35,000 words. The new version needs to be 20,000 words. This week’s job is to cull 15,000 words without annihilating the story completely. I think I have spent nine months writing this book to date, so, looking at it that way, I am culling three or four months work. That should make me feel bad. Like I’ve wasted my time. But it doesn’t. In fact, it makes me feel great. It is exhilarating to have to remove material from a book. To have no choice. You have to look for look for anything weak. Anything that does not directly tell the story. And you realise that there is a lot that can go. Well, I do. That could be a weakness in my original work, or it could be a valid part of the writing process. The book is question is called Over the Line and is about a soldier from WWI who won two medals for bravery at the Somme, then went on to score England’s first goal after the war. It will be published in March 2014 by Barrington Stoke. Unless I have annihilated it. It’s called Over the Line and is about a soldier from WWI who won two medals for bravery at the Somme, then went on to score England’s first goal after the war. This entry was posted in Uncategorized and tagged editing fiction, Over the Line, writing for children, WWI on August 27, 2013 by whyiwriteblog. Someone on Twitter commented recently that my events in schools seem to always revolve around play. It was not something I had spotted before, but it’s true. The three school events I have been using in 2013 have been the Football Reading Game, the Rugby Reading Game and an event comparing making an Airfix kit aeroplane to writing a story and where we do both. I use playing when I do school events because I am scared that if I just stand in front of 200 children and talk about myself and my books that I will be boring. I’m not that charismatic, so games and play help me keep things lively. To be honest. So I was interested to hear about Play England’s campaigns to encourage children to play more. They have developed a charter for children’s play that takes on the barriers to children playing, often barriers in adults’ minds. Barriers like fear of injury, fear of so-called stranger danger and fear of upsetting the local community. Also barriers such as lack of space and time and supervision for children to play in. I work in a lot of schools, urban and rural. There are astonishing differences between the spaces children have to play in their schools. Some of the urban schools have car parks taking up most of the original playground and small or no playing fields. 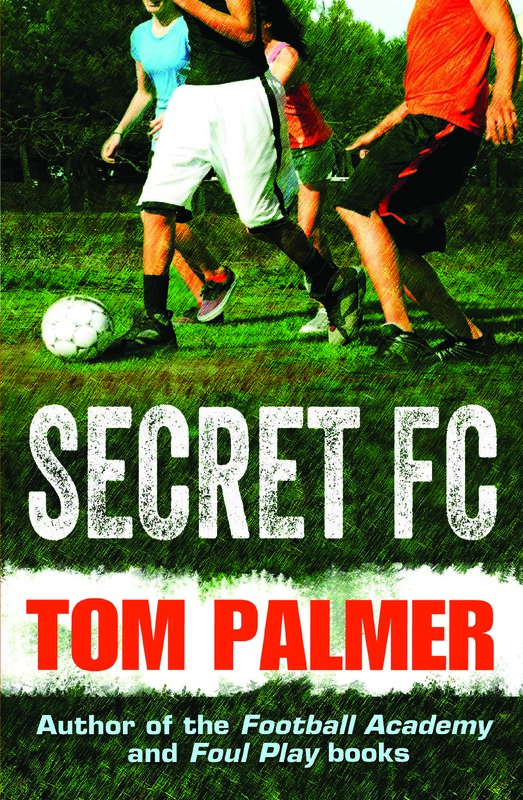 Seeing that inspired me to write Secret FC, which is published by Barrington Stoke this week. Secret FC is about a schools where there is a tiny playground. The new head teacher’s first move is to ban football because he feels it is too dangerous to the school’s younger children in such a small place. He also has big issues with risk, after a friend of his had a terrible accident when he was a boy. The children are devastated. They only have one place to play football in their neighbourhood. School. Now that is gone. So – with the spirit of creativity and problem-solving that children will never lose – they find a secret place in the small wooded area between some railway lines. And form the Secret Football Club. In the end that spirit of the children wins the adults round and they reach a happy compromise with the adults. They use play to overcome barriers and anxieties. A bit like me using play to overcome my fear of boring children to death. This entry was posted in Uncategorized and tagged barrington stoke, play, play england, secret fc on August 19, 2013 by whyiwriteblog. I was there to talk about my Barrington Stoke books, Ghost Stadium and Secret FC, which I did a bit. But I feel a but uncomfortable just talking about my books at events, so, instead, we played the Football Reading Game. A quiz about football reading material, followed by a penalty shoot out. I know I am supposed to be at a book festival to talk about my books. I know that I am the author and that people are supposed to want to meet an author and buy their books. But – like I say – that makes me feel uncomfortable. That’s why my event is about what the children like to read and about giving them a bit of fun. I was lucky that Calum was there. Calum works at Blackwell’s in Edinburgh. Calum went in goal. He did a fine job. Sixty-plus kids took penalties at him. He faced about 110 in all. He only let in 15 or so. After that I went for a walk down to the Princes Street Gardens with the BBC. Radio 4. They wanted to do a piece on my books. In particular about Barrington Stoke and what makes their books so attractive to dyslexic children. We chatted. We had a kick about. It is supposed to be aired on Thursday. I’ll update this blog when I know more. More from the festival tomorrow as I do a schools event. This entry was posted in Uncategorized on August 18, 2013 by whyiwriteblog. I’m in Edinburgh. Due to do a talk at the Edinburgh Book Festival this afternoon. This is a big deal for me. Before I became a children’s author I used to run book festivals. One in Bradford. And, briefly, the more famous Ilkley Literature Festival. That was my career before writing. Putting on author events in bookshops, libraries, theatres and football stadiums too. I hosted over 500 events in my time. Before I tried to get published I thought you had to be something special to be a published author. I was thinking along the lines that you had to be very intelligent, rich, maybe from London and – perhaps – posh. …what I’m saying is that when I ran book festivals I met authors and realised they are mostly just normal people. And that the one thing they have in common is a strong drive to write, to be writers. Meeting authors at book festivals made me believe I could have a go at being a writer. That I could dare to dream. I even dreamed about talking at book festivals. Anyone can write. You don’t have to be special or rich or clever or posh. You just have to want to do it. This entry was posted in Uncategorized and tagged book festivals, edinburgh book festival, writing on August 18, 2013 by whyiwriteblog.